Nadine completed her undergraduate physiotherapy degree in 1993 from Curtin University (WA) and worked in both public and private hospitals, mainly in the area of orthopaedics. She also spent some time working in London and moved into private practice on her return in 1999. In 2003, she completed a Masters Degree in Orthopaedic Manipulative Therapy and became involved in sports coverage including on-field rugby cover for Sydney Uni, City2Surf and half-marathon events. She also volunteered with the NSW Sports Physio Committee, organising continuing education programmes from 2002-2004. 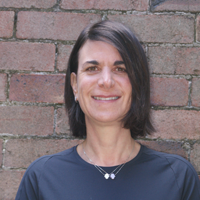 Nadine joined Coogee Physiotherapy in 2003 and took over as the principal owner in 2008 when the clinic relocated to its new larger premises, offering more treatment rooms and facilities. She has also been involved with Maccabi/Haokah soccer, Coogee United and other local football teams for over 13 years. She has been overseas with indoor and outdoor soccer teams as well as working in the athlete’s village at the 2006 Melbourne Commonwealth games. Nadine enjoys the community aspect of working at Coogee Physio, treating families, sporting teams and giving back to the local community.